Get ready to sparkle! The icon of Orthaheel Technology, our best-selling Tide sandal, is now offered with a sequined upper. The Tide Rhinestones is designed with the rebel in mind. A total rock star, this timeless flip flop with bling takes the spotlight this spring. The Vionic Tide Rhinestones Navy features the same great Orthaheel Technology and fit you’ve come to love and expect. This iconic, best-selling style now has a soft nylon webbing uppers with man-made gems.. Podiatrist-designed, biomechanical Tri-planar Motion Control footbed with a deep heel cup helps stabilize, support and realign the feet back to their natural position. 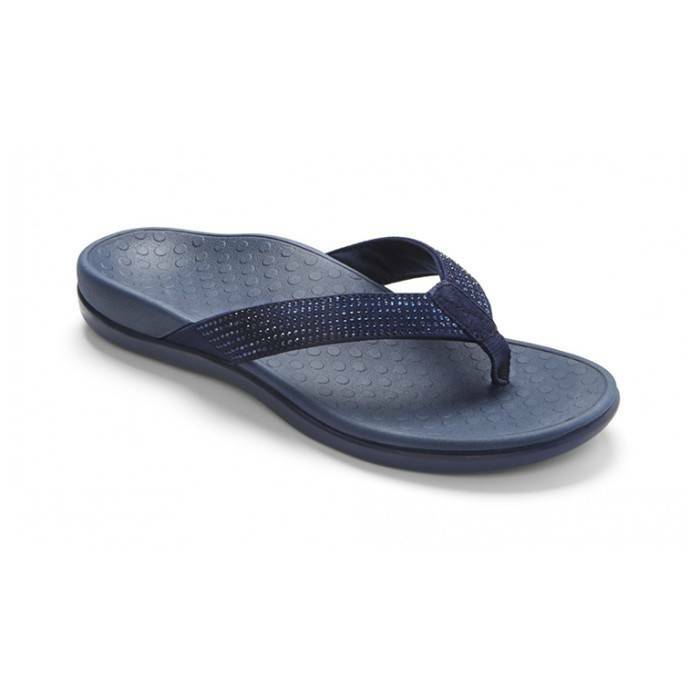 A soft woven toe post and foam-lined strap ensure a comfortable fit. The Vionic Tide Rhinestones comes with a lightweight, flexible medium density EVA midsole absorbs shock, reducing stress on feet, ankles and knees. A durable TPR outsole with patterned tread helps improve traction. The Vionic Tide Rhinestones is recommended by Dr. Andrew Weil and has received the APMA Seal of Acceptance.